128 kid bikes, add some parent bikes, 8 dozen doughnuts, much-needed coffee for the parents who don’t like to get up earlier than necessary, police escorts riding with the kids and blocking intersections with patrol cars = successful Bike to School Day. We hope you enjoyed Bike to School Day and Bike to Work Day! 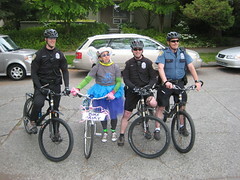 This entry was posted in bigger than here, bikes, extravehicular activities, family cycling, neighborhoods, School, seattle, sustainability and tagged Bike to School Month, family, Family Cycling, kids, School. Bookmark the permalink. I was at the West Seattle Bridge about 07:00am this morning and I was really impressed with the amount of parents I saw riding with their children.